All gun tragedies are horrible, however the recent drive by Sandy Hook relatives to expand background checks is misguided to say the least. The shooter in Sandy Hook did not buy a gun without a background check, he borrowed his mothers who was completely within her rights to purchase guns. Tragedies, such as the Boston marathon bombing, are horrible when they happen but unless a police state is set up to watch everyone all the time they will happen. Are we going to ban all fireworks, fertilizers, sugar, pressure cookers, heavy objects, and cars from citizens? Will licenses need to be issued for each of these items? Instead what is going on is a push towards a global UN managed registry of gun owners and a very crucial step towards the eradication of the 2nd Amendment. Not allowing citizens to own guns or any weapon for that matter means each family will be helpless to defend themselves against criminals and criminals will know that – a pack of five men would be pretty confident they could ransack a place knowing that lawful families will not have guns in their house – be it an 8 gauge shotgun or AR-15. What else will be confiscated after guns, well probably gold and silver. I’d like to think that our world is peaceful and everyone gets along – however this is false. Most people will fight each other when they feel their survival is at stake, many will fight for resources to come out on top, others will fight for the front of the line if no checks are put in place, and yet others will fight just because they feel like it. My point is that most folks know what the law is and what the consequences are for breaking the law, given the someone lax system we have in place some will risk breaking the law knowing the punishment combined with the risk is less than the reward and will then break the law. If lawful folks have the capacity to maintain the law in their own jurisdiction (their home) then folks will think twice about testing the punitive system of any given home. The most important reason that Americans should own guns is that we have fought too long and hard against tyranny to let our freedom of self defense to be undermined by a tragedy. How does one lose one’s freedom? First of all, lets consider this from an individual level: a man loses his freedom when he commits a crime, fails to defend himself, runs out of money, or joins an organization which requires the forfeit of certain freedoms. These are major reasons why people around the world do not have freedom. Prisoners do not have the freedom to go where the choose, eat what they want, or simply live how they want to live. The reason for this in most cases is that the prisoner has done a crime and is paying for it with time behind bars. A person living without a gun or weapon in a crime ridden street has no chance to defend himself and will have to forfeit either his life or his worldly goods in the case that someone who overpowers him enters the house. A person who runs out of money must live their life paying back loans and possibly even joining the first category of prisoner. A person who joins a secret organization such as an intelligence agency forfeits his right to go to the countries of his choosing, hanging out with certain types of people, and sharing certain types of information. How do these things apply to a country? Exactly the same, except the consequences are not always direct and imminent. When a country habitually commits crimes against humanity, other countries will decide based on whether or not it is politically, strategically, or economically beneficial, to intervene against the rogue government. This has happened in recent history against Hitler’s Germany, Facist Italy, Imperial Japan, Vietnam, Korea, Kosovo, Somalia, Afghanistan, and Iraq. The leadership of these countries except Vietnam and Korea ultimately had to give up power. Examples of countries which failed to defend themselves span the centuries and all share the common trait of no longer being sovereign. Corsica, the island in the Mediterranean Sea shaped similarly to the United States, is owned by France. Hawaii, a neutral nation ruled by Chieftains, was annexed into the United States in the late 1800’s. The Cherokee Nation, and all other American Indian tribes excluding the Inuit, were forced into reservations by the United States. Countries, unlike individuals, do not lose their national power when they run out of money. In fact, the people of those countries lose power and must cede it to their government as money is printed by the ton to make up for the lack of real value. As the government can spend as much as it wants with its fiat currency, the people must bear with making wages that drop in value in the double digits in the span of weeks! See Zimbabwe, which boasts yearly inflation in the millions(%)! 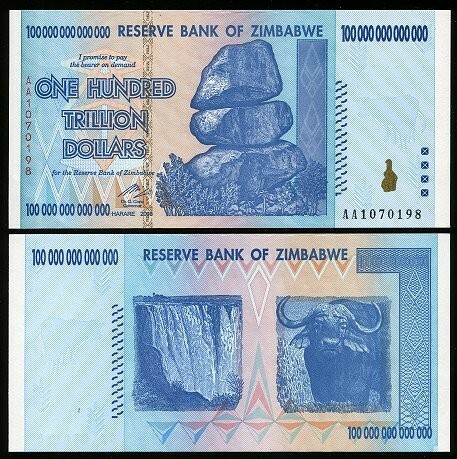 There was a point at which Zimbabwe’s currency doubled every 1.3 days, and the bank has printing 100 trillion dollar notes (see photo) . Countries also lose their freedom when they join multinational organizations such as the United Nations, the World Trade Organization, etc. I will not go into the details today of how come countries cheat the WTO by putting trade protection on certain exports yet subsidize others. Another point about freedom that must be stressed is that once a freedom is threatened by violence and hence not performed, that freedom is lost. If anyone is interested in reading more from Ron Paul’s book, you can get it for cheap at Amazon.com. If not, try searching Google for “Ron Paul Policy Freedom” or “ Niccolo Machiavelli” for more information.